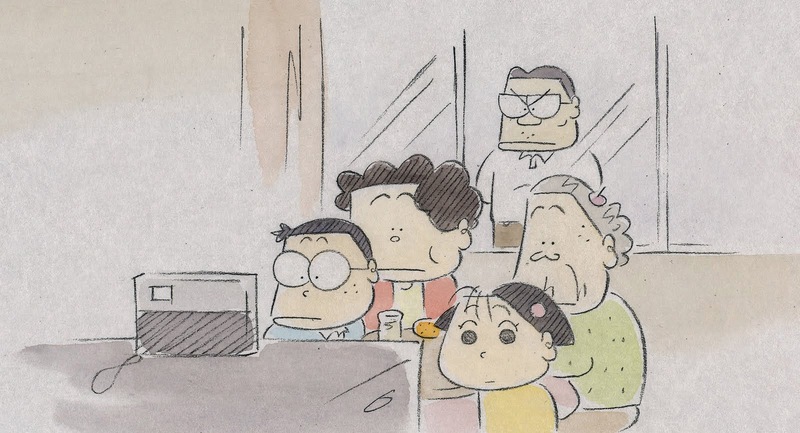 Rather than the bold and bright animation of Pom Poko, Isao Takahata’s My Neighbours the Yamadas is a collection of short stories celebrating family. Indeed, the anime style of Studio Ghibli is considered a defining element of the studio itself. The watercolour, pastel-coloured animation of My Neighbours the Yamadas combined with the flippant, YouTube-like length of each episode, separates this film from the others. We observe the trials and tribulations of the small Yamada family. Mum, Dad, teenage son, a (roughly 5 years old?) young daughter and Grandma. Stories range from family-engagements as they return from shopping realising they’ve lost the daughter to duo-plays between Father and Son, or Mother and Grandmother. There is no narrative that runs throughout the entire film and, between the larger-scale bookends of the film (a toboggan race to represent married-life and a final flying-on-umbrellas musical number), it is merely comedic vignette’s shrewdly observing the highs and lows of this family life. Isao Takahata, director of Grave of the Fireflies (heart-breaking wartime animation, told from the perspective of deceased children) and Pom Poko (a retelling of the magical tanukiwho can morph into humans and use their testicles as parachutes) manages to reinvent his approach to storytelling – and changes the definition of what animation should be. His films couldn’t be more different and shows how he himself can morph between artistic styles for the sake of story. In comparison, Hayao Miyazaki clearly showcases a more consistent and definitive style. But it is Takahata’s sense of detail that is so engrossing. The family dog, whose apathetic eyes seems to capture his I’ve-seen-it-all-before mood. The father, Takashi, shifting gears as he speeds back to collect his daughter. The briefest of brush strokes and minimal lines that manage to capture the humour, tone and attitude of this clearly loving family. Each character is shown to have many more sides to read too. Takashi’s laziness is offset by his keenness to bond with his Son, Noboru. The put-upon Mother Matsuko, who endlessly prepares food but has to contend with her own forgetful Mother, Shige, throughout the day. Clearly, My Neighbours the Yamadas will never be considered a masterpiece, as Spirited Away and Grave of the Fireflies is, but it is unique. The wry jokes that capture the atmosphere and truth in every family, shows a sharp script. The animation may provide a limited visual palette for our attention, and after an hour of mini-movies, this can get tiresome. But like many Studio Ghibli films, My Neighbours the Yamadas offers a different meaning to feature-length filmmaking. Cartoons are not necessarily for children, and they can be a moment to laugh and relate to the trials and tribulations of all families. The father slowly considering his sanity when forgetting an umbrella; a son who realises family-inheritance will surely, inevitably, involve him; the family-member whose timing of a family-photo is at the most inopportune time. My Neighbours the Yamadas speaks to the heart – something many blockbuster, computer-cartoon behemoths of Hollywood often miss.